This is how not to take care of home financial matters. Do not attempt to do online banking with children on your lap. Especially don't try to pay the credit card bill with a kindergartner sitting behind you on your chair, two other little guys alternately climbing into your lap and back down the other side, while trying to answer a boy who is asking what he can eat, and getting a teenager to turn off his video game. If you insist on doing all this at the same time (because it is the day the bill is due, of course), you may end up inadvertently transferring money FROM your credit card into your regular checking account, instead of the other way around. And then, not only would the credit card not be paid, you might also get a late fee. And that's in addition to the big fee for the "cash advance" you just gave yourself from the credit card. This might look like an exciting circus act, like spinning a dozen plates while balancing upside down underwater with hungry sharks, but do not be fooled. It is not fun. Do not try this at home. I was cleaning up my room yesterday. That may not seem like a big deal, but it has been a mess ever since we moved. There are just too many things that don't really have a home, so they end up in our bedroom. Or things that need to be kept out of the way of small children. They end up in our room. Papers and bills and papers that need to be kept would usually go in an office, but we haven't had one. The file cabinet is in the storage garage. In our room. My favorite books? In our room since I don't have any bookshelves. Christmas presents waiting to be wrapped? Leftover Halloween candy? Things that need to be returned? Electrical cords? Family pictures that haven't been hung? All in our room. It's been a disaster. I decided that if I kept waiting for... what am I waiting for to be able to clean my room? A personal organizer, a free week, or a bunch of money maybe. I can tackle a big job in small chunks - I've done it before. So I decided to do three little chunks: clear off the dresser, clear off the cedar chest, and hang a few pictures. I need to feel like I sleep in a little sanctuary rather than in a storage unit. Nope, no before and after pictures. I think all of the pictures are before pictures, and I don't think I will ever get to the after stage. But if you want to picture two feet of boxes and clothes piled on the cedar chest and the whole dresser covered several items deep, you'll get the idea. It took a while. Of course, it was much more involved than I thought it would be. It always is. Angel came to watch as I was finishing the cedar chest. I put a few things in to store (a few baby girl outfits that I wore which had been hanging out in my mother's cedar chest, a baby quilt I got 21 years ago, a pair of little boy pants I made when my first started kindergarten, and some lovely pillow cases my grandmother had embroidered) and pulled out a small white tablecloth. I spread the tablecloth over the worn fabric on the lid of my cedar chest. Angel sighed. "It is so pretty! I think we should have a picnic here!" When I reminded her that we only eat in the kitchen (she is not the tidiest of eaters), she paused for a moment before blurting out, "When I am 70 I will eat here, because you can eat anywhere you want when you are 70!" Hmmm. My dad is 70. He eats in his bedroom or the living room sometimes. Maybe I'd better be making plans for where I will eat when I am 70, too. These boys are so far away from us. I had a reality check to that last week when I was researching the hurricane (they call them cyclones in the Indian Ocean) that went through Madagascar. Whatever happens there is so far away from me, and from my ability to do anything about it. As a mother, it's hard to stand by and watch instead of be actively involved. It's all part of growing up, isn't it? I love getting their letters, and for a small moment, feeling like they are back. People do love the gospel and they just need somebody there to tell them that they are missed, and then all the sudden, they start coming back to church and everybody is like 'We missed you. Where have you been? What can we do for you?' It is truly humbling to see the members rally around the less active and invite them back to church. One of my Spiritual Highlights for week comes from when we were meeting with a new investigator that Brother N., the first counselor in our branch presidency, referred us to. The lesson that we had with him about the restoration and that the Book of Mormon is the word of God was really amazing. He is one of those that has definitely been prepared to hear the message of the Gospel and it is amazing to work with him! I love the Gospel. I wouldn't trade it for anything! This week I have definitely been seeing the blessings of families and individuals firmly rooted in the church. Since lots of the members here are way new, we have to be the doctrine checkers a lot. It is very apparent, however, who is really trying to root themselves in the scriptures and the teachings of latter day prophets. Those who study consistently and make that study a valuable use of time have a much greater knowledge of the gospel and they are more confident in the way that they live that. I guess what I'm trying to say is count your blessings. Having a long history in the church is a very great blessing and I feel very blessed to have that! What do you do when you have kids with cold ears? Why, you cover them, of course! 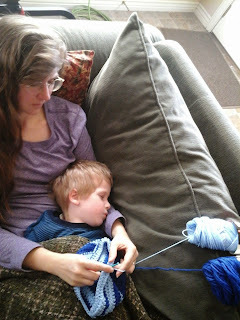 This is what I've been doing over the past couple days while I've been snuggling with my sick kidlets. And I'm writing out the pattern for you. You are welcome. 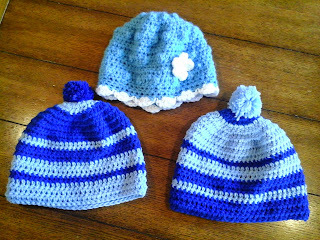 Actually, it's for me because I'll forget how to make them by next week when David decided that he wants a hat, too. I used this diagram I found on Pinterest (but can't find the real source, sorry) to make the top circle. I will write out the pattern as if you already have a working knowledge of how to double crochet and you know how to do things like start a circle and join with a slip stitch and change colors. 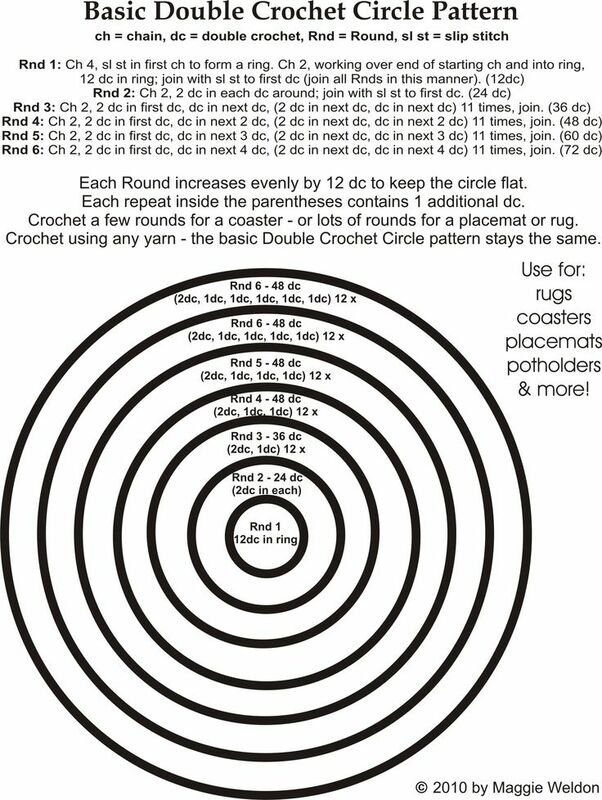 I made the top, flat circle only 5 rounds for my 4 and 6 year olds. It's a little loose, but I wouldn't want to go smaller or it wouldn't fit for very long. They grow too fast! That's all. It's really easy, which is why I could make three of them in two days. I put bubbly puff stitches (3 DC in same stitch, but don't take off the last YO of each, then on the 4th DC, YO, pull through, YO, pull through all 5 stitches on hook) here and there to make it more fun for her. She's a bubbly kind of kiddo, and was delighted with the added bit of fun. I got the cute little flower here, and it works up in just a couple of minutes. Fast! This one was just changing the colors to make it more interesting. Oh, and a puff ball on top. The boys love the pom-pom, but I wonder how long it will be before all their threads are picked out! We've had a bit of a bug going around our house the last while. Oh yeah, I had it too. Fortunately, it's not a nasty messy kind of cold, just a slow couch kind of cold. 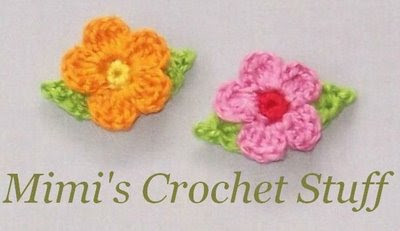 While I was holding my little ones, I wanted to have something to do, so I got out my crochet hook and some yarn. I wish I knew where my other supplies were, but I had some yarn and two hooks, so away I went. I started out by making a little hat for the girl. Her cute hair is not thick enough to keep her little head warm as she walks to school in the morning. A couple of weeks ago, I let her pick out some yarn and I made her dolly a cap. Now it was time to make her one to match. It worked up in an afternoon, but as soon as I had it done, the twins wanted hats, too. Of course. So today I worked on hats for them. I loved sitting on the couch, snuggling my little snifflers. First one needed a quiet break, and then the other. It won't be much longer and they won't want to sit on my lap or cuddle with me anymore. I'll take all I can get. They helped me hold the yarn, laughing as it tickled through their fingers. They cut the yarn when I was done with a color, and dutifully tried on the hat several times. Finally, Georgie closed his eyes and settled into me, pulling the blanket up to his shoulders. He ran his fingers through his hair, then through mine, and drifted off to sleep. I listened to his soft breathing turn into cute little snores and reveled in our closeness. I'm so glad I get to keep him and hold him and cherish him for a while. 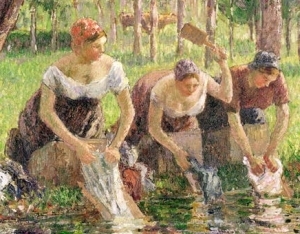 I have some clothes that were not getting clean, so I decided to hand-wash them. I've been bad-mouthing my mother's washing machine and giving it bad looks. Maybe good, old-fashioned elbow grease could do the trick where modern water-saving appliances were failing. In lieu of a washboard, I just swished the clothes, and rubbed the stubborn spots between my knuckles. I was right. I was able to scrub them clean. I also scrubbed all the skin off my knuckles. My fingers have been hurting like I had bad burns on them for about a week. Today, I'm grateful for the washing machine. And maybe I ought to see about finding a washboard or a river. I'll just start with this picture of what we had for dinner tonight, because it looks kind of fancy. So many things went wrong with this meal that I have to remind myself that it turned out alright, in spite of my best efforts. Yesterday was a day off school, and we had planned a Musical Monday. Our musical for the week was The Sound of Music - all three hours of it. For more fun, I had supplies to make rudimentary marionettes and puppets (from the Lonely Goatherd puppet show scene), and lots of yummy food. My dad, being German himself, does not mind at all when I start to cook with a German accent! For lunch we were to have bratwurst and round loaves of fresh, dark bread with cheese and apple beer (a meal my dad often ate during his mission to Germany). 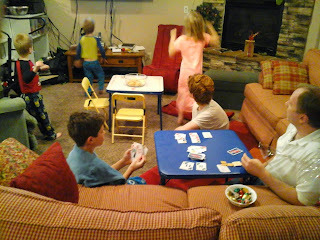 At snack time, we had planned popcorn (because it's a movie, duh), and herbal tea with jam and bread (from "Do-Re-Mi"). 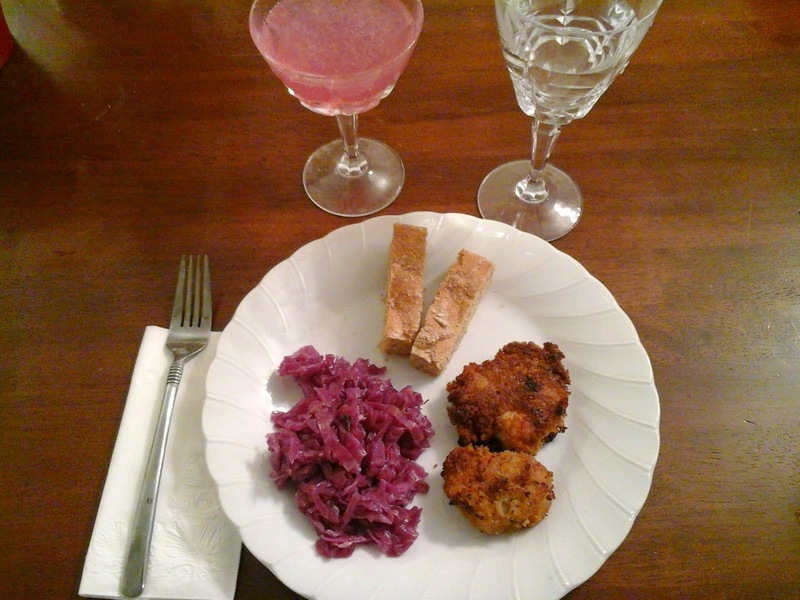 Dinner was homemade red cabbage (because it's traditional and so yummy! ), lemonade (that the Baroness was drinking on the porch), and schnitzel with noodles and crisp apple strudel (from "My Favorite Things"). And of course, we had to eat on our finest china (like the dinner scene where Maria makes the children cry). We watched the movie, and it was fun. Even the boys enjoyed it. I first saw it when I was little - on Halloween when my folks took us to a movie instead of trick-or-treating. We even had the album, just like this one. It felt nice to be just sitting - in between making bread and slicing red cabbage. As it turns out, I was feeling a little under the weather. The bread didn't rise quickly enough, and then fell disappointingly. As I started to make the red cabbage, I noticed that the recipe not only called for 3 hours of steeping, but also sitting overnight.. And then I learned that the breading on the schnitzel required an hour in the fridge before frying. And I had a fever and a headache. So we got hamburgers for dinner instead. Hamburg isn't far from Austria, right? We tried again the next night, when I was feeling a bit better. But still, I forgot to make the noodles, and I couldn't find the apples for the strudel (they were hiding in the fridge). Things never quite work out how I want them to. As it turns out, David and Eddie helped me make the schnitzel, and it was tasty. The bread was good, even if it was flat. And the red cabbage was amazing after a day of sitting - at least I thought so. The boys weren't fond of it. 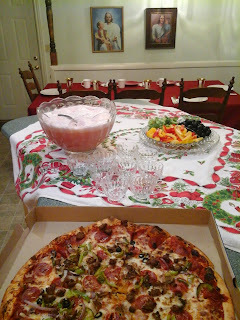 Everyone liked the pink lemonade, and it looked downright festive in my mother's crystal goblets. And I made a boxed German chocolate cake. Done. It wasn't the spread I had planned, but it worked out just fine and we all enjoyed it. That's the important part, isn't it? "Nothing comes from nothing - nothing ever could." It never would have turned out to be anything more than our usual pasta Monday if I hadn't tried for something different. I didn't hit my goal, but I must have done something good. I am just now learning about Cyclone Chedza, which killed 13 people and caused severe flooding in most parts of Madagascar! It passed just south of where our boy is,so he just got heavy rain and some winds. So grateful that our boys are safe! This week was just another witness that the Lord really loves his children and that He leads and guides the church! The attendance at church this week was again almost double of what it has been. It was only five less than what we had last week! We are still working hard, and hopefully we will see the number of our less actives dwindle down and die. But that just means that they are going to be active members once again! It really is amazing to see how the members rally around others and how we can really use the church as a strong point. Apparently a cyclone came through, which is like a tropical storm, I've heard varying reports about how serious it was. Short story is we had crazy weather for like two days and lost all of our pretty flowers in our yard, our neighbors lost their wood fence, some people in our area lost their brick wall, and all the plants now look like they are trying to lay down and go to sleep. You can see all the corn leaning in one of my pictures. Yes, I am going to go all Armstrong over you. Deal with it. Did you see this? It was stunning. Just before I was able to get my camera out, the entire sky was pink. Spectacular. And these were taken in my own yard. On my front porch, even. What a privilege to be here! Thanks you, Lord, for this amazing place we get to live. I so dislike the phrase, "I'm sorry." Somehow we have gotten so past the point of acknowledging another person's feeling that we think two simple words can cover a multitude of bad behaviors without needing to do anything to fix the problem or change our comportment. It does nothing to appease the injuries of the one offended, or to assure that the wrong won't happen again. When my children have misbehaved and I have tried to teach them to apologize, they fling the word at each other like a weapon , causing additional harm with its cutting tone. I've even heard, "SoREEE! Ya happy now?!?" It's not working. So when I recently came across this article at cuppacocoa, I was encouraged. 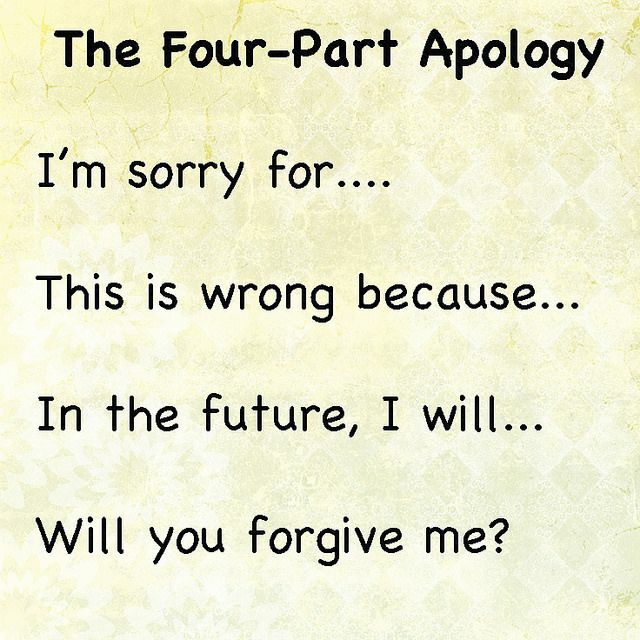 It talks about a proper apology needing four different parts. I'd even tack on a fifth: What can I do to make it better? We went over this in Family Home Evening on Monday night, and we've had some good success with it so far. Today, Georgie was throwing a stuffed penguin when it lodged on top of the living room fan blades. Good throw, really. Angel tried to get it down by throwing heavy pillows at it, and succeeded in breaking off one of the fan blades! The penguin nonchalantly watched all the drama from his safe perch. After the hubbub died down, I took Angel in to see Opa and explain what she had done. It is his house we are living in, after all. It was hard for her, but she managed to make the whole apology and did a fine job of it. That was a whole lot better than a muttered "sorry," and it is starting to make a difference in this house. Usually when something goes awry, I pull my lips into a hard, thin line and I don't say anything at all. In my mind are no words, just something of an evil thunderstorm. 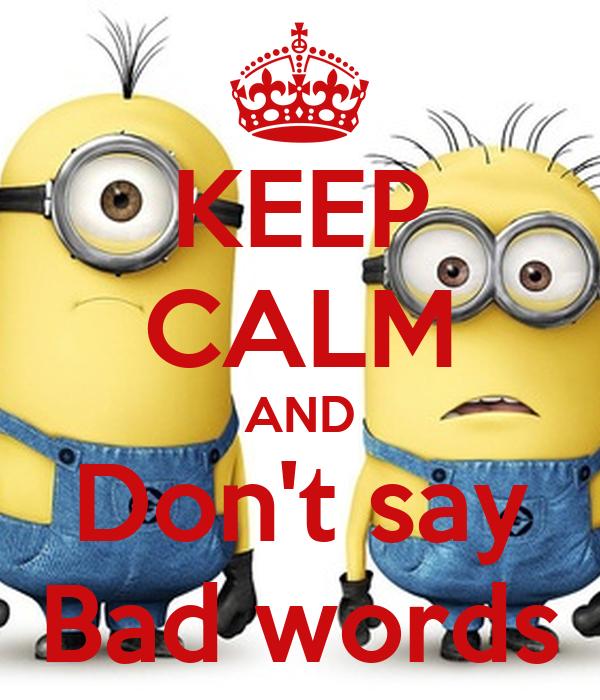 If there are other people around, to lighten the mood somewhat, I might mutter, "bad words." My husband especially will laugh at that. But the today as I was trying to get two loaves of very soft sourdough bread into the hot oven without making them fall, I discovered that the oven rack was set at the wrong height and the pan would not fit in. Out of nowhere, I hear the words, "Oh, fetch!" What? What was that? Eddie, who was helping me, looked up in surprise. "What did you say, Mom?" "I'm not sure," I mumbled, finally getting the pan settled on the rack and the oven door closed. "I don't know." I set down the hot pads and leaned against the counter. 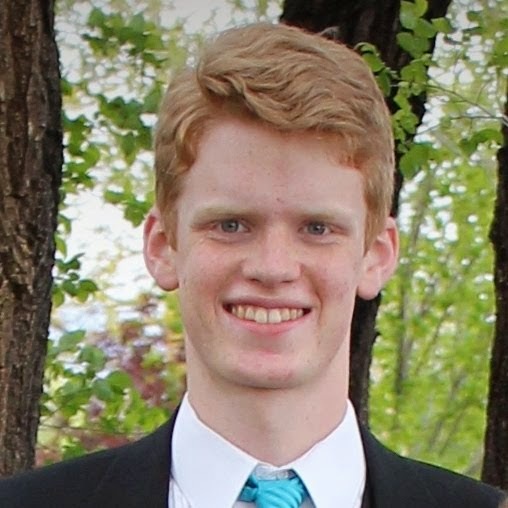 I know it is cliche for Mormons to use odd phrases instead of cuss words, but I didn't that particular one until I went to college and heard a friend - from Arizona - say it. I guess it is just a fill-in for stronger swearing, or for being able to command the vocabulary needed to adequately express your feelings. And it does sound funny. It was never part of my repertoire, or a saying I've regularly heard, but for some reason it popped out of my mouth. And I laughed at myself. 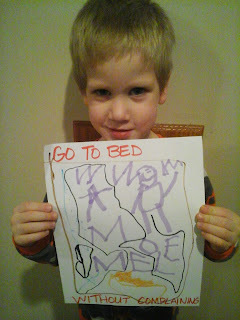 I Was a Bad Mom - Or Was I? A whole bunch of years ago, I was the mother of a willful boy. Come to think of it, I still am. We just do better at working together than we used to. One day, this boy - maybe 11 or 12 - was upset. I don't remember now what it was about, and I don't know if I even knew the reason then. But he threw a temper tantrum and ended up running out of the house and climbing up our cherry tree. The tree was large and the branches were sturdy. The boys had rigged up platforms and shelters and swings and even a zipline or two from its canopy. Many hours were spent under those shady leaves, and now my boy was up there and wouldn't come down. I tried everything I could think of. I wheedled and cajoled, talked and reasoned, demanded and threatened. When nothing worked and I lost my patience, I stormed next door to my parents' house. My youngest brother was still at home and had been especially close to my older boys. It was his aid I enlisted as I threw up my hands in desperation. "Whatever you need to do! Just get him down!" I went back to my house to give some love and attention to the other four boys who had been frightened by their brother's outburst. I don't know now how long it took before the boy came down, or if he was happy about it. I have a strong suspicion that he wasn't. But I probably felt relieved that this particular trial was over, and I might have even felt like I won the conflict in the end. As I look back, I wonder why I couldn't have just left him in the tree. Did I really need to assert my superiority by insisting that he come back into the house? I'm not sure that's what I was doing, but whatever my motive, I don't think it was right. If I had a do-over on this particular situation, I would have allowed this determined boy of mine all the time he needed to sit in the tree, settle his heart with the aid of nature's balm, and sort out his feelings. And when he finally came back in, I would have greeted him with kind words and love. I'm a better mom now than I used to be. I have more experience and wisdom, and I've learned an awful lot. When I think back on my "bad mom" moments, I feel bad for my children - and for myself. We've had some tough times. Recently I was feeling discouraged for all the parenting mistakes I've made. There have been a lot of them. But then I felt a sweet rush of peace and a gentle reminder that I was doing the best I could. It wasn't necessarily my best in every given moment, but overall I was doing the best I knew how to do. If I had known better then, I would have done better then. The warmth in my heart told me that it was all forgiven, and that I did ok in my inexperience. Today, as I look at those same older boys, I do feel a twinge of guilt for not having parented them better. I was not the best mom as I was learning - but they weren't the best sons, either! We've all come a long way and become better. So maybe I wasn't that bad of a mother. Maybe I did just what I needed to under the circumstances. Maybe these boys will turn out fine anyway. ...oh wait, they are. They are amazing, so I must have done something right. I've been doing a bunch of learning about parenting. You'd think that since I have been mothering for ... nearly 21 years now, I would have it down pat, huh. Unfortunately, not so. As I was reading, I remembered a difficult mothering situation. Maybe I'll write about it tomorrow. Just now - nearly 10 years later, I've finally figured out how to deal with that challenge successfully. And I felt bad for these older boys, who had a very young and inexperienced mother. I wasn't as good at mothering then. But as I read their letters and see what strong young men they are, and how awesomely they are doing, I don't feel so bad. Maybe all that I did (and didn't do) was just what they needed. We had so many lessons and it was rewarding to see the payoff on Sunday. Normally we have about 45-50 people at Sacrament Meeting, and on Sunday, we had 75! Of those 22 were Less Active and it was really awesome to see them come to church! Oh, and in addition to that, (a background story first) time to people here in South Africa is really an elastic kind of thing. You say 10:30 and it can mean anything from 10:30 to Noon, so we struggle to get people there to church on time. That being said, on Sunday, we had all of our young men there before Church started, and three of them were there 30 min before so that they could prepare the sacrament! So amazing and powerful! We taught a family last week, and then when we came back yesterday, the wife told us that her husband was touched by our message and he stopped drinking, staying out late, he doesn't smoke anymore and he's been trying to be a better person! We didn't teach him about the Word of Wisdom either! We just barely taught about the restoration and that's it! It was so neat! I thought I was doing so well in this new year, posting every day - and then my writings didn't show up on the blog. I figured out the problem, and they are back! So look through the posts before this to see what I "posted" this week. My kids say the funniest things! No, not the funniest. I think that distinction goes to my sister-in-law, JaNae. Her kids are side-splittingly hilarious on a daily basis. But mine are pretty funny, too. I had to write some of these down because I forget them. I'm talented that way. Georgie: How about one more Sunday and then I can be a grandpa? Freddie: No. Don't dump hot soup on my head! I will say "ouch!" and I will be dead and you will have to scrape it all up and you will have to pump my head in the toilet then you will have to flush and then pull my head out! Georgie: I have two problems. One is I want to see Heavenly Father and Jesus and the angels. And the other is that I want to play a Wii game. Freddie: Who is this? So Grandma, are you dead? Where are you?Do you have an airplane in your backyard? Angel: Guess what? I got a pencil from my teacher and then I lost it and Gram gave me one of hers and I lost that one too. Can you believe I lost two pencils in a row? Gram is probably so upset about that. Georgie: (when prompted to get off the phone and let somone else have a turn) No! I still have a lots of dings to say! We have an odd tradition in our family, and it involves pizza and china. But we like it, and no one complains, so I think we'll keep it. Many moons ago (286, to be exact! ), I went to the temple and married a nice man. It was the most beautiful wintery day - cold and clear, the sunshine glinting off the clean snow like a thousand diamonds. We wanted to remember that day and celebrate it forever. But the next year, the end of our college classes got in the way, so we didn't celebrate it much. The next year, there were Christmas parties that night, so we didn't celebrate it again. By the third year, with a toddler and a bun in the oven, we realized that getting away to celebrate our anniversary during Christmas would be difficult. So we decided to change it to a family birthday party. It is the date that our family started, after all. We started a new tradition of having pizza on our fanciest dishes, eating by candlelight, and topping it off with birthday cake. That was a tradition we could handle during the hustle of a holiday season. When Jay died, the tradition was all the more special to us. But when Trent and I married, it became a bit awkward. How do you celebrate your anniversary to your first spouse while you are married to your second? 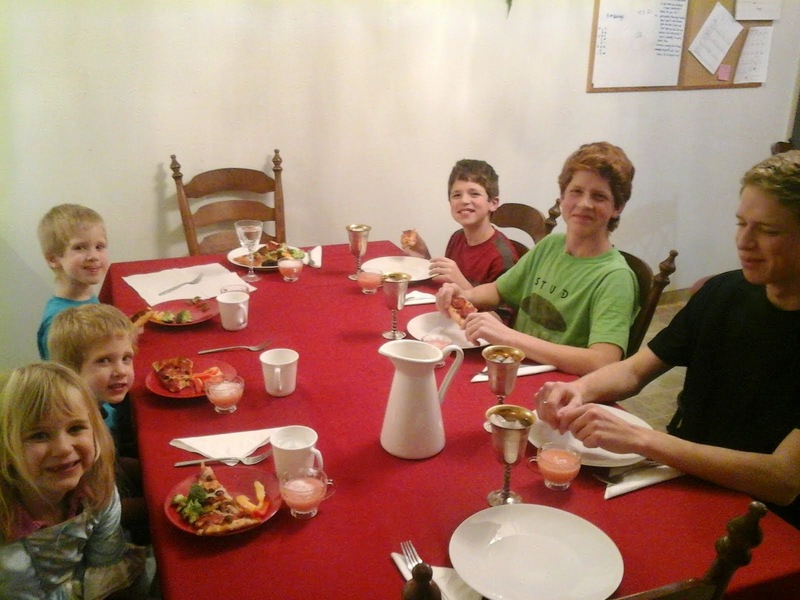 Fortunately, Trent is very easy-going and does not mind celebrating our family birthday party with us. It is when our family started, and we love our family. So break out the pizza! This year, due to our active 4-year-olds, we decided to forgo the candles. Safer that way. But we did make the old-fashioned punch that I remember having at family parties growing up. It's the really difficult kind, with rainbow sherbet and orange soda dumped in. I think we used some raspberry creme soda in there, too. I can handle this meal. We put olives on our fingers, dabbed the corners of our mouths with fancy embossed napkins, and held our pinky fingers out so daintily as we guzzled punch. And we didn't even break any china. Yeah, I think we'll do it again next year. This year, my word is nourish. I so like the idea of picking a word as a theme instead of making specific goals. I can't see what the year will hold, and sometimes my aspirations don't match up with what real life looks like. But I can work on getting better in some areas. It's all part of being a better and better person. Isn't that what we are all about? This year, I can nourish myself and those around me - physically, mentally, emotionally, and spiritually. When I think of nourishing, it is twofold: not giving in to the easy way of inputting junk, and getting the good stuff in instead. Here's to a lovely 2015! We had Family Home Evening last night and talked about the new year and how it is a good time to make a fresh start and resolve to do better. I love seeing what is going on in these wonderful little heads. 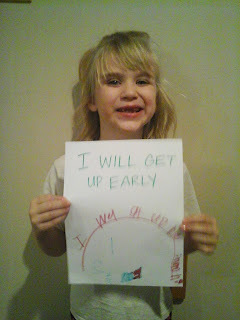 Angel wrote her own words (in red), and I think that is her bed at the bottom of the picture. 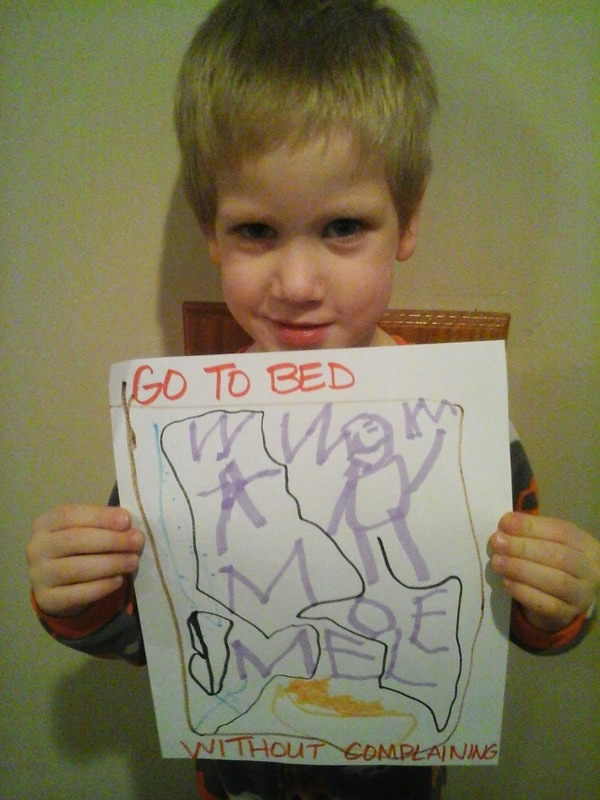 This is Georgie and his self-portrait. He is starting to write letters to represent words. David had quite a few good goals. I'm not sure if he would be thrilled that I posted this, so if you see him, don't ask how he is doing on these. And here is Eddie's cute face. I love his expressions. And I love that they are all trying to do better. Trent wrote his goal on some app that he thinks is great because he just found it. 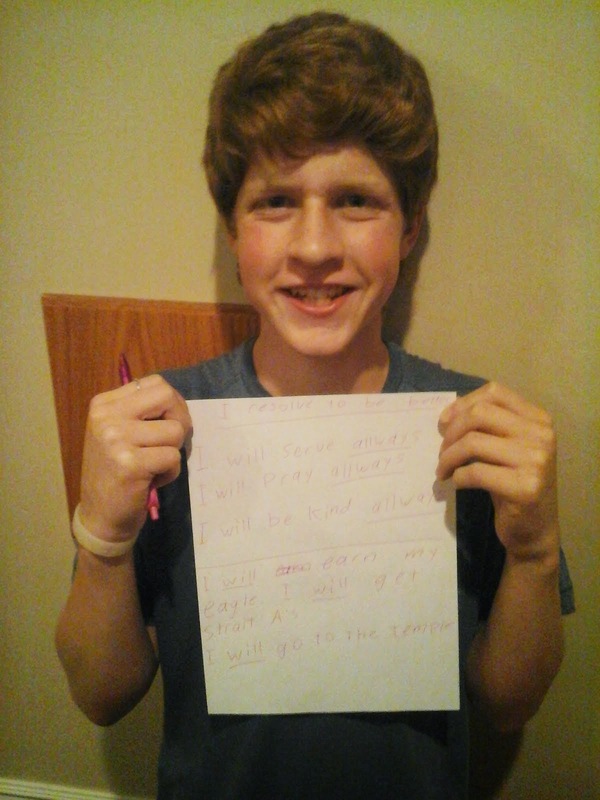 Hopefully that works for him! Chris is at work, but I'm sure he wants to improve and be a better person too. Right? Watch out 2015 - it's gonna be a good one! Stay tuned for my word of the year tomorrow. It was just amazing to see how much they have grown. That sounds so trite, but it was inspiring, and humbling, for me as a mother to see the amount of personal growth in their faces. Their voices are the same, but there is a different light there. They carry themselves more... confidently. More lovingly. More gently and yet more strongly at the same time. My boys are growing into men, and I am delighted and gobsmacked about the whole thing. And I love them more than ever. 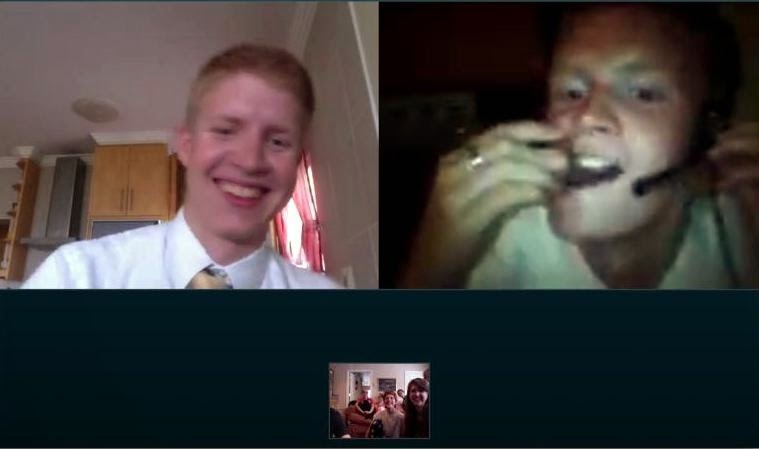 This is our screen shot of one laughing and the other demonstrating how to properly enjoy Christmas chocolate. Loved it. Yesterday was fast Sunday, and because we have been dropping a lot of people because they aren't actually doing anything, Elder Razakamandimby fasted that the people who wanted to learn would find us and ask to learn. So now you're thinking, oh, so then someone came up and asked to learn, and it was all great and happy. No. Four people did. And then at a couple of our lessons THAT DAY they brought family members to come learn with them who hadn't learned before. It was fantastic! 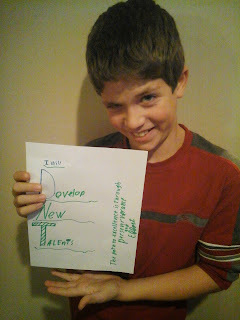 It was pretty cool to see how quickly our prayers were answered! So far, it has been a happy new year. That shouldn't be surprising. Everyone tells you to be happy about it. But this year, for the first time in a long time, I really feel happy. 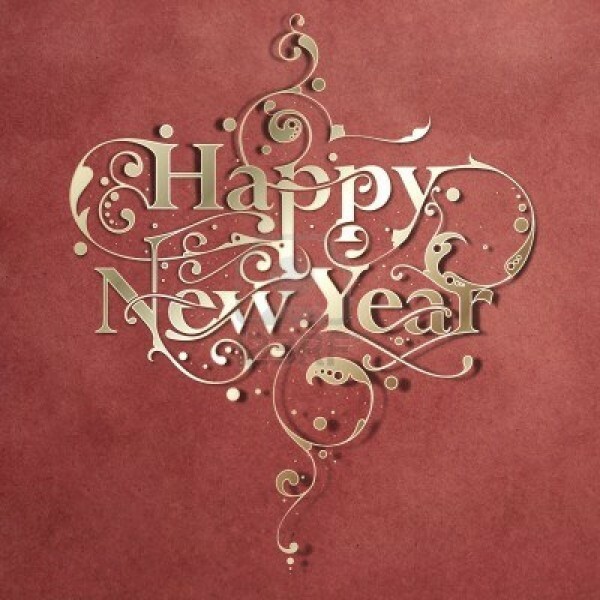 I am encouraged about the start of a new year, and I really think it will be better than the last. I'm not sure why I feel happy about the new year. Usually New Year's Eve finds me weeping over all the things that went awry over the year, and bedding a sad farewell to the things I dreamed would happen. But this year - not so much. Could it be that I am at peace with living with my dad and caring for him? Could it be that we hung out in our Christmas jammies all day? Could it be the joy from seeing my two oldest boys serving missions? Could it be that I am figuring out that I am better than I thought I was? Could it be that my relationship with my husband is better than it has been in years? Could it be that I didn't drink the eggnog that I accidentally let go sour (what a waste!)? I'll let go of the why and just be happy for my new year. I think it will be a great one! Welcome to the quietest morning of the year! I think most everyone in the country is sleeping in or hung over or some combination of the two. Trent commented that this would be the right time to be attacked. What a nice sentiment! Actually, New Year's morning is when Teancum snuck in and killed the Lamanite leader. Interesting tidbit of the day. So iv you are planning to invade, go for it. You won't meet much resistance in this house, because we are all too tired. We partied hard last night. Well, maybe. Define "hard." In fact, you'll have to define "party." Alright, alright. We just stayed up late and enjoyed being together. Eddie, David, Trent and I played all the way to the long, long end of a Phase 10 match. Or maybe we watched Angel and the twins dance to their movie. It was fun to see them jump up and run or dance as they were watching! Funny kids. My dad joined us for the last bit and shared traditional German pfeffernuesse and chocolate covered marzipan with us. We tried to get the little ones into bed earlier, but Netfix's countdown with King Julien was jammed with too many other parents who were trying to do the same thing. In the end, we watched the ball drop, hugged each other, and were just happy to be a family. David did have to go outside and bang noisy things together, and the little ones finally went to bed. Chris called from his party and had to be reminded that when I say "be home at 12:30" does not mean "you may start a movie at 12:30." So happy new year, everyone. Hope it's a good one for all of you!